Hello all! We hope you had a great week and can look forward to a fun weekend. As usual we are sad to say goodbye to this week’s guests. Goodbyes stink! 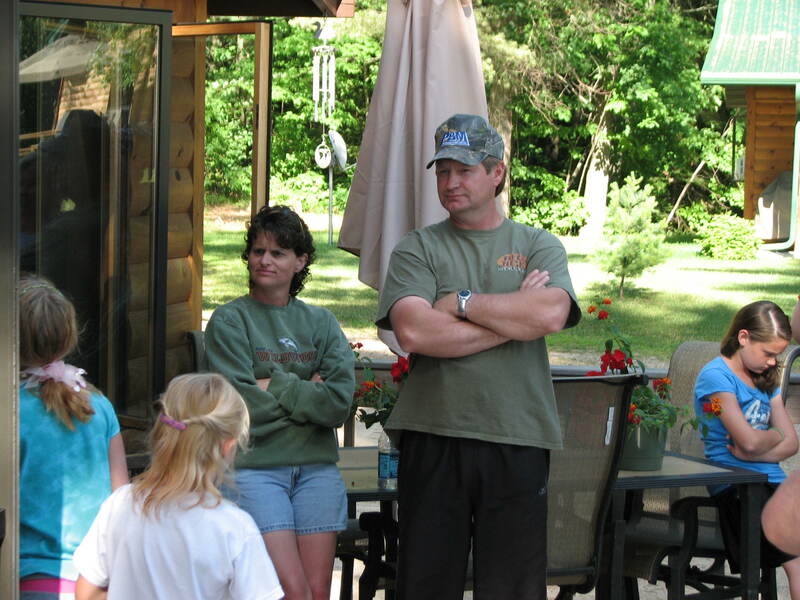 But then after a hard day’s work on Saturday we get to welcome back new guests who are excited about their week of vacation at Wildwood. Saturdays are a crazy rollercoaster around our house in the summer! Proof! This ain’t no perch, people!! The fishing this season continues to be outstanding. We are seeing nice walleye, big sunfish, some big northerns and, finally(!) big bass. 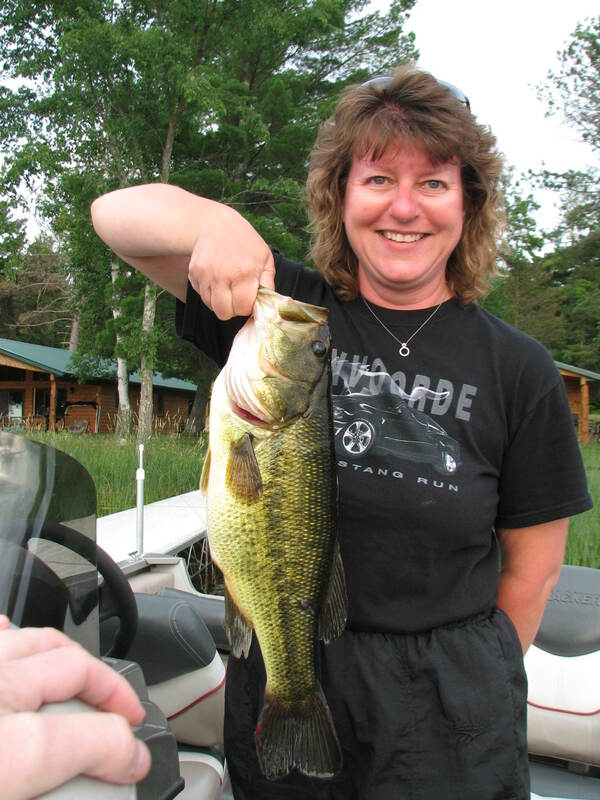 We love to bass fish and so do many of our guests. This last week the largemouth bass seemed to come out to play and we saw lots of nice ones. This week the biggest we saw was 4 lbs but there were many in the 3lb+ range. Jay and I even got out fishing this last week…just the two of us! I caught a very nice bass and Jay did NOT!! Lightening chased us in off the lake before he could catch one for himself so I’m enjoying bragging rights until we find time to fish some more. He continues to “shrink” my fish in his re-telling of the story so by next week he will probably be telling people it was a perch the size of a hot dog. However, I have proof! Gotta love camera phones! This week we had some excitement that, fortunately, doesn’t happen often! A guest needed emergency assistance after a fall and the ambulance was called for only the 2nd time in 13 years. We are so gratified to have an outstanding volunteer fire department in Cohasset. Volunteer firefighers were on the scene in a matter of minutes followed quickly by the Meds-1 ambulance crew. The care and compassion demonstrated by all involved was incredible and we are happy to report that altough our guest is banged she is doing fine. She even got to fish during her remaining vacation days and that’s all she cared about! Our many thanks to the heroes of Meds-1 Ambulance and the Cohasset Fire Department! The coming week will be a busy one in our area with lots of fun thing to do and see. We are so fortunate to own a resort in beautiful northern Minnesota where there are so many natural, cultural and just-plain-fun things to do! The Mississsippi Melodie Showboat performances start this week and continue each weekend through the next two weekends. It is such a fun show! If you are in the area be sure to check it out. The KAXE Riverfront Festival is tomorrow and beginning Thursday the downtown Grand Rapids businesses will be having Krazy Days. 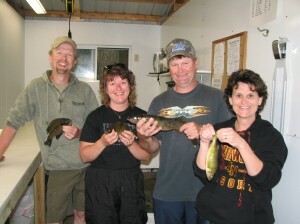 (You can see more details about area events at: http://www.visitgrandrapids.com/vacations/calendar/july_aug_sept.html) Add fishing, swimming, relaxing, tubing and waterskiing to the list of fun and you can see there is so much to see and do during your Minnesota vacation at Wildwood Resort! 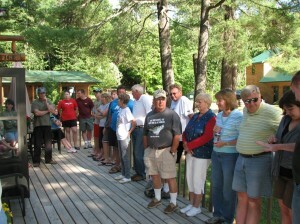 We have discounted our July 30th opening for Red Pine Lodge. 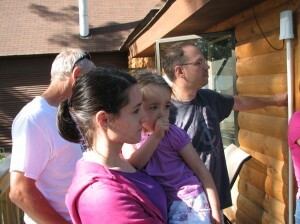 Call us today and you can book that 4 bedroom Lodge for the 3 bedroom rate – a savings of $400! 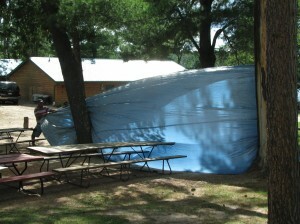 We also have an opening the week of August 6th in Cabin 4. Have you booked your summer vacaatin yet? If not, we hope you will consider a stay with us this summer! 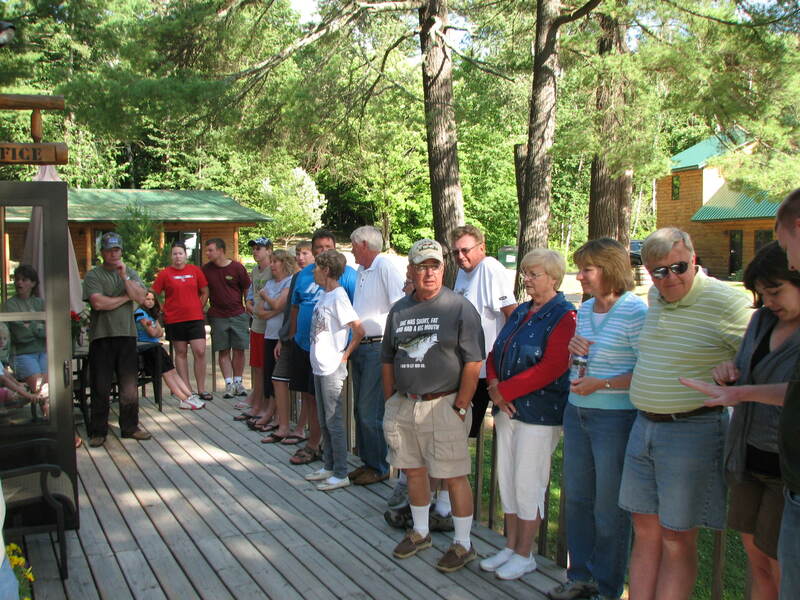 Introductions are part of the potluck tradition at Wildwood! 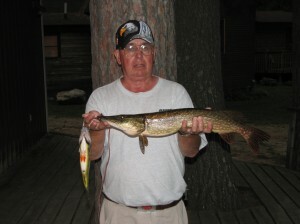 This one wasn’t quite big enough for the contest but it was a nice northern pike! 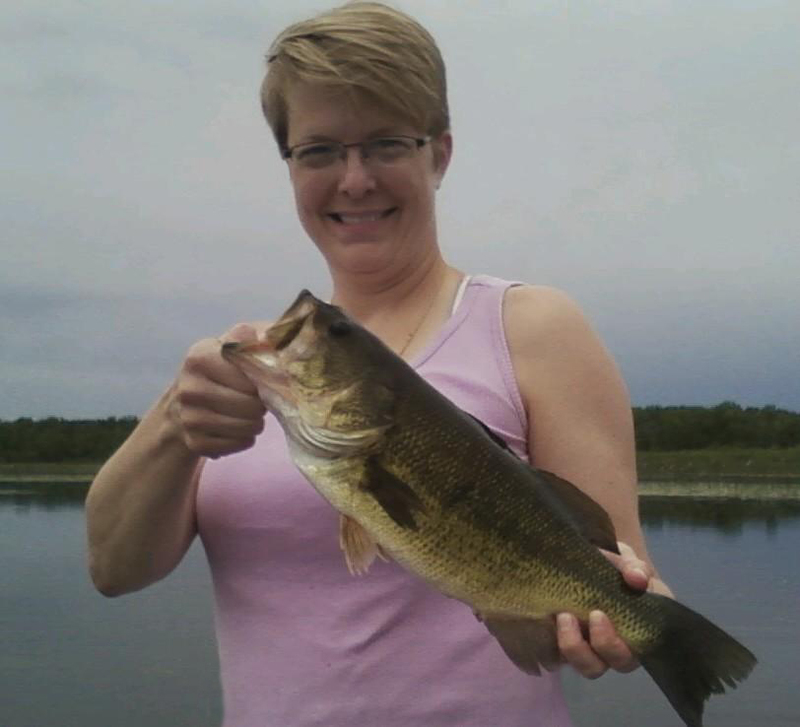 Thsi 3lb 9 oz bass was released! It was a bit windy this week for potluck so Dad and Jay put up a windbreak.